The Alexander Leaf Distinguished Scientist Award for Lifetime Achievement was established by the Society in 2002, both to honour the work of Dr. Alexander Leaf and his support for ISSFAL, and to create an award for future use to recognise and reward excellence in the areas of research of relevant to ISSFAL core interests. 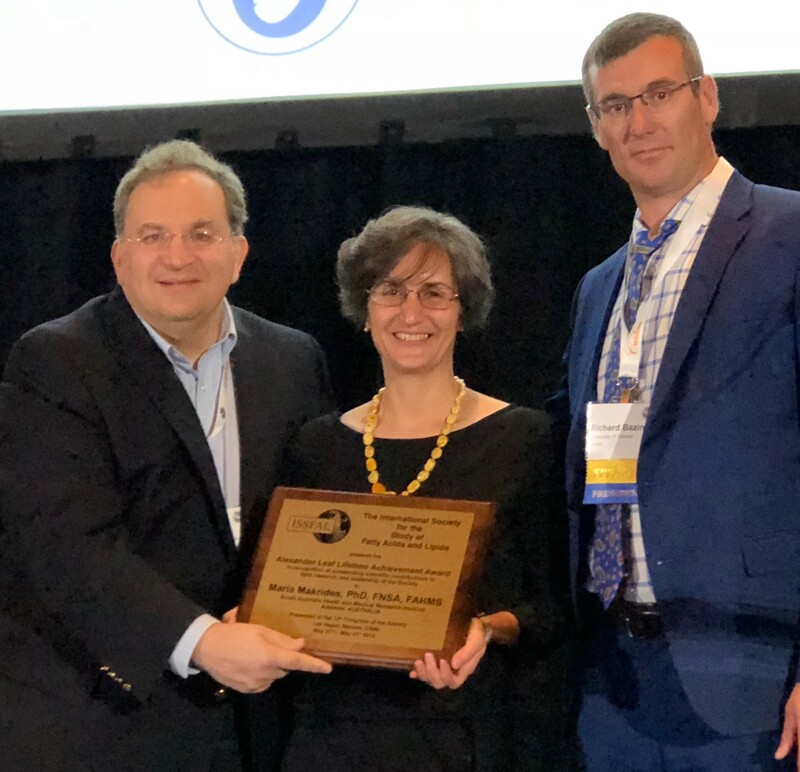 The Ninth Recipient of the Alexander Leaf Award was Maria Makrides of the South Australian Health and Medical Research Institute & School of Medicine (SAHMRI), The University of Adelaide, Australia. Presented at the 13th Biennial Congress in Las Vegas, USA. Presenting the Award to Dr. Makrides are ISSFAL President (right) Dr. Richard Bazinet and ISSFAL Immediate Past President Dr. Tom Brenna. 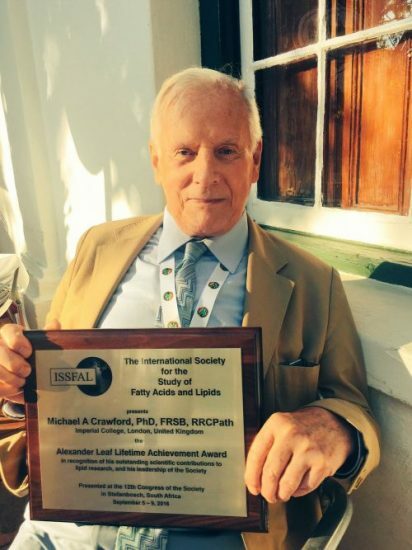 The Eighth Recipient of the Alexander Leaf Award was Michael Crawford, Professor at the Imperial College, London, UK. Presented at the 12th Biennial Congress in Stellenbosch, South Africa. The Seventh Recipient of the Alexander Leaf Award was Andrew Sinclair, Professor of Nutrition Science, School of Medicine, Deakin University. Presented at the 11th Biennial Congress in Stockholm, Sweden. The sixth recipient of this prestigious award, presented at the 10th Congress of the Society, held in Vancouver in May 2012, was Dr. Robert Gibson, Director of FOODplus Research Centre of Adelaide, Australia. 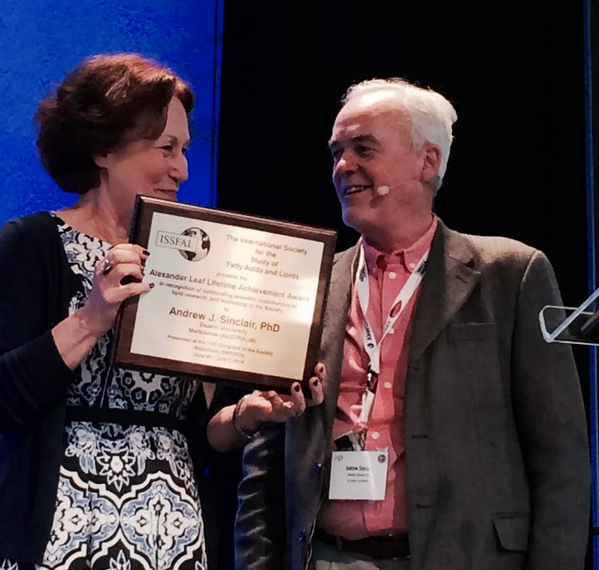 In the photo, ISSFAL President Susan Carlson presents Dr. Gibson with his award in Vancouver. The fifth recipient of this prestigious award, presented at the 9th Congress of the Society, held in Maastricht in May 2010, was Dr. Norman Salem of Martek Biosciences (now DSM Nutritional Products LLC). In the photo from left to right are President-Elect Susan Carlson, Norman Salem, President Philip Calder and Congress Local Organizing Chair Jan Glatz. The fourth recipient of this prestigious award, presented at the 8th Congress of the Society, held in Kansas City in May 2008, was Dr. Art Spector, Emeritus Professor of Biochemistry at the University of Iowa, USA. The picture shows Art holding his award, with to the left, President of ISSFAL, Dr. Michel Lagarde; next to Michel is Past President Dr. Norman Salem, and on the right is Vice-President and President-Elect Dr. Philip Calder. The third award in this series was made at the Society's 7th Congress, held in Cairns, Australia in July 2006. The recipient of the third Alex Leaf Award was Dr. William Lands, and the photo below shows him accepting the award from the Past President of the Society Norman Salem Jr (right- a former work colleague), watched by Philip Calder, the current Vice President and President-Elect on his left, and to the left of Philip, Society President Michel Lagarde. The second award in this series was made at the Society's 6th Congress, held in Brighton,UK in July 2004. The recipient of the second Alex Leaf Award was Dr. Jorn Dyerberg. The photo shows him receiving the award from the then Society President Norman Salem, Jr. The first time this award was presented was the 2002 Congress of the Society, held in Montreal, Canada in May 2002. The first winner of the award was Dr. Alexander Leaf, and the picture below shows him accepting the award from the then President of the Society, Art Spector, while the picture to the left shows the plaque he received.